Sisterhood of War: Minnesota Women in Vietnam, by Kim Heikkila. ​St. Paul, MN : Minnesota Historical Society Press, 2011. MNHS call number: Reading Room DS559.8.W6 H45 2011, also available for purchase. Patrick Cawley Vietnam Papers, 1970-1971. Photocopied and handwritten letters from Cawley, a helicopter pilot with the 1st Cavalry Airmobile, 82nd Artillery, Battery E, to his parents in Prior Lake, Minnesota while stationed in Vietnam. 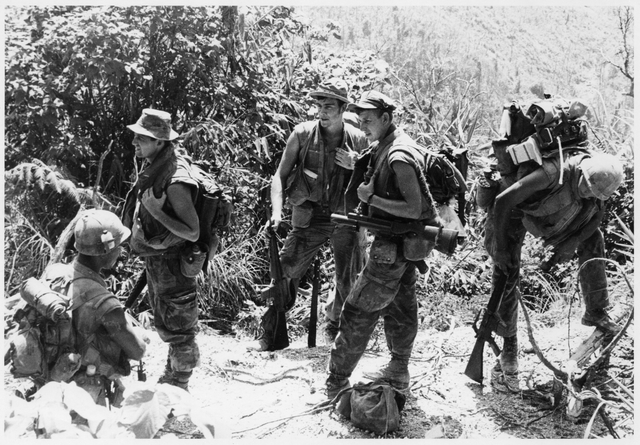 Additional papers include Cawley’s pilot certification; award citations; color and black and white negatives depicting Vietnam, helicopters, U.S. soldiers, Prior Lake, and family; a photocopied map of troop locations (circa 1970); a window sticker printed with the phrase "The First Team;" letters regarding Cawley’s 1970 death in Cambodia; and his obituary. MNHS call number: See the finding aid in the library (P246). Correspondence, photographs, memorabilia, and obituaries related to a St. Paul (Minn.) man who enlisted in the Marines and died of heat stroke while serving in Quang Nam, Vietnam. MNHS call number: See the finding aid in the library (P2051). This archival collection (1969-1973) consists of flyers, leaflets, posters, petitions, newsletters, newspapers, and other printed matter centered on the protest movement against the Vietnam War (1969-1973) in the Twin Cities metropolitan area. Anti-war actions documented in the collection include local and national protest marches and demonstrations, student strikes, teach-ins, draft resistance, and fund raising benefits. MNHS call number: See the finding aid in the library (P1996). American involvement in the Vietnam War lasted for two decades, through the administrations of five presidents: Eisenhower, Kennedy, Johnson, Nixon, and Ford. Characterized as a battle against a Communist takeover of Southeast Asia, the war found support from Congress and the public through most of its first decade. But by 1966, when youth activists began questioning and protesting against the United States' involvement, they framed a ten-year debate on the underlying national political and social issues laid bare by the conflict: the unfairness and inequities of the military draft, racial discrimination, poverty, and officials deceiving the public. J. Edgar Hoover, head of the FBI called the protesters "Marxists," whose aim, he said, was to destroy democracy. As the toll of death and destruction mounted, over 1,070 Minnesotans were killed in combat, the protest movement grew in numbers and spread across the country. Violence erupted in cities and on college campuses. Police used tear gas against protesters on the Minneapolis campus of the University of Minnesota. The Vietnam war was brought to an end on April 29, 1975, with Ford's order for evacuation of the American Embassy in Saigon, after the fall of the city to North Vietnam forces.